An excellent non-latex value for low risk applications. 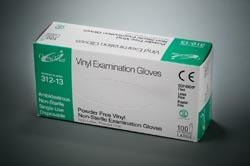 OmniTrust™ vinyl gloves are formulated for comfortable fit and tactile sensitivity. Flat packed for optimum dispensing. Available in sizes Small through Extra Large. OmniTrust™ Powder Free Vinyl is free of DEHP (di-2-ethylhexyl phthalate) DOP (di-octyl phthalate)!